If you have not been taking Bitter Kola, otherwise known as Orogbo, you may need to read this. Bitter Kola as a nut has a brownish outer cover while the inner part is yellowish in colour. It contains a juicy substance which is assumed to be the active ingredient. Medically, anybody can eat as many as he or she prefers to consume by pulling off the outer coating but be mindful of its bitterness. This tropical fruit also interfaces with your body's ability to produce and store new fat, causing more of your own stored fat to be burned off for energy. Garcinia Kola popularly known as Bitter Kola or 'Orogbo' in Yoruba, is also known to help decrease levels of harmful LDL cholesterol. Bitter Kola could be used in treating opportunistic infections associated with HIV because of its antibacterial, detoxification and cleansing properties. Bitter Kola contains Saponin Chemical which is responsible for its cleansing effect. Saponin is mainly used as a tonic for the liver and it enhances the functions of the liver and gall bladder. It is also very effective in the treatment of a cough, diarrhoea, tuberculosis and other bacterial infections, when food is suspected to be contaminated, it will forestall the development of any infection or poisoning. In the past, Bitter Kola was eaten by the elderly because of their believe that it could prolong age, but researchers in modern science have revealed that Bitter Kola contains chemical compounds that will help the breakdown of glycogen in the liver and has other medicinal uses for its longevity property in man. The naturalists recommend Bitter Kola for children that are suffering from measles and mumps. For this therapy, grind the Bitter Kola and mix it with honey. It will help to heal the wound. This should be taken orally and also applied externally in the case of mumps. It is also efficacious in stopping vomiting in children and adults, especially pregnant women. 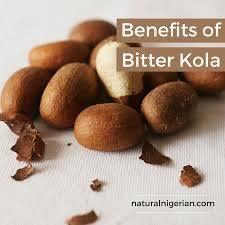 Bitter Kola can also be used to clear coarse voice. It clears the voice by stimulating the mucous along the lining of the vocal tube, thereby softening the dry throat. It can be eaten anytime. It has no side effect under normal circumstances because it is one of those medicines that has no overdose. Naturally, it is advised that you balance your food intake. That is, when sweet foods are eaten in excess, the body tends to be more acidic. Hence, in order to balance this, bitter foods should be eaten occasionally. Bitter Kola is highly recommended for this purpose.